But in fact it’s all true and very Orwellian. They have been — and are still — covering up their discussions using high-level security clauses: section 15 (1) – International, and 21(1)(a), (b), and (c). These are not your garden-variety access to information clauses either. These are heavy-duty clauses that only eight investigators across Canada can peek under — and challenge the removal of. I know that fascinating fact because I recently got a package of partially unredacted documents from DFAIT. They came as a result of writing to Suzanne Legault, the Head of the Office of the Information Commissioner (OIC). Remarkably, the OIC responded by immediately launching an investigation. But it took almost two years before I got anything. Just recently, I received a batch of partially “un-redacted” documents from DFAIT. The process is a bit of a dance. The OIC cannot command or order that DFAIT remove them. They need to persuade them to remove the redactions. For example, to defend keeping the s.15 (1) redactions, DFAIT would have to prove, “The evidence of harm must be detailed, convincing and describe a direct causation between disclosure and harm.” In cases where the OIC and DFAIT cannot agree, court is the final option. We’re not finished yet though, there are still lots of redactions remaining. So let me show you what DFAIT was covering up with the high-level security clauses. But first, some context. In 2011, I had signed up as a Canadian business-owner for help to “navigate the complexities of international markets“. I contacted the Trade Commissioner in Toronto, Candice Rice. She wrote to the Canadian Embassies in Europe. I am forwarding you an email request from Franke James, artist, author and environmental crusader. You will find her impressive bio on www.frankjames.com [sic] and detailed information on her portfolio below. An exhibition of Ms. James’ work will be travelling to your cities during 2011 (see dates below). Ms. James would like to discuss the feasibility of holding a press conference at the Embassy/Consulate and would also like to invite post participation in the opening of the shows. She has already been in touch with Berlin separately (first show on the tour). I would appreciate if you would contact Ms. James (copied on this message) to discuss how you may work together with her to promote the exhibition. So, my request was to rent space for a reception or press event at the local Embassies in the towns where my show was going to be. 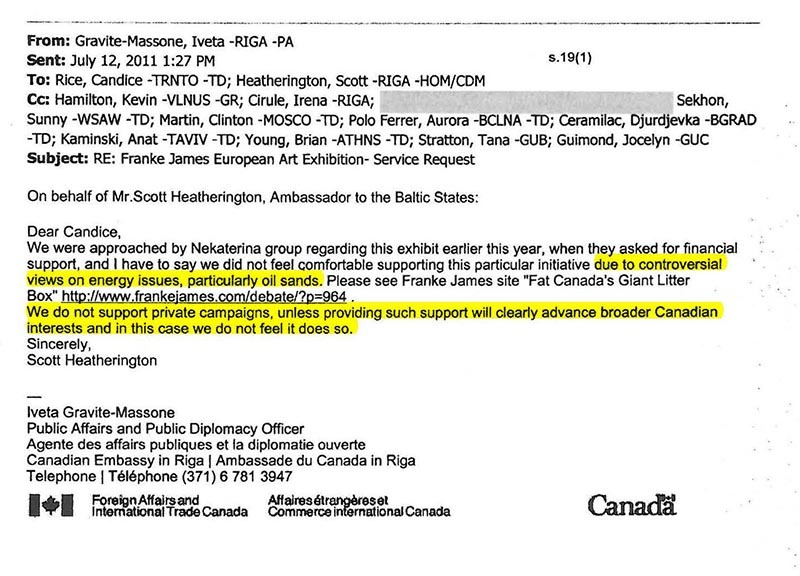 But as we can see in the email below, Ambassador Scott Heatherington is clearly not supportive. He explains to Commissioner Rice why he had not felt “comfortable” supporting Nektarina’s request for funds for my climate change art show. He directs her, (and everyone else cc’d) to look at my visual essay, Fat Cat Canada’s Giant Litter Box, which is critical of the tarsands. The two redactions are blacked out using s.15 (1) International and 21(1)(b). 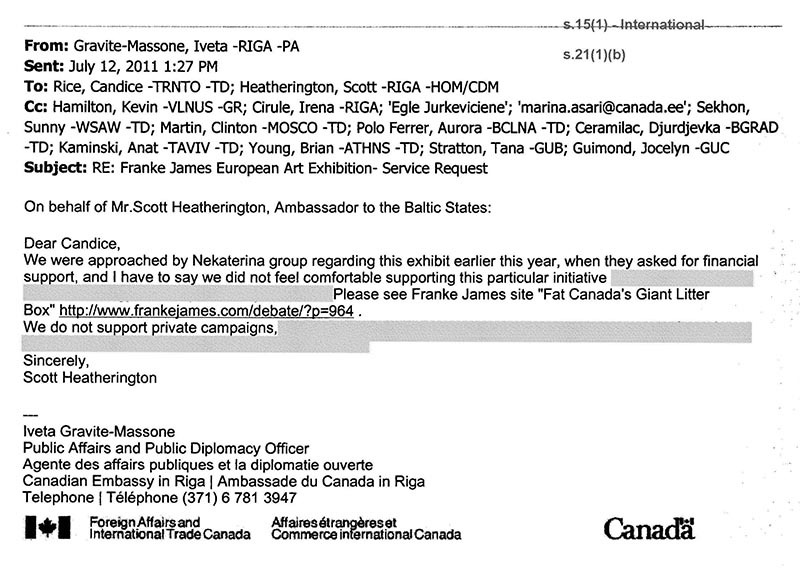 Now we can see that Ambassador Heatherington said that he won’t support my request to rent event space at his Canadian Embassy “due to controversial views on energy issues, particularly oil sands.” His statement reveals that there is a double-standard for access to Canadian Embassy services. Because my political views don’t match the current Harper government’s, then I am blocked from accessing those services. And remember this example of political interference is being hidden from view by using s.15 (1) International. Heatherington closes by saying, “We do not support private campaigns, unless providing such support will clearly advance broader Canadian interests and in this case we do not feel it does so.” Some Canadians will nod in agreement that Canadian Embassies should not support a project which is critical of Canada’s oil sands. However this is wrong for a number of reasons. I asked to rent space at my own expense. Under the Charter of Rights, all Canadians are equal. Shouldn’t I have equal access to Canadian Embassies, regardless of my political views? Ambassador Heatherington is censoring me because my political views on the oil sands are not in agreement with the Harper government’s. Nektarina’s application for climate advocacy funding was approved by Sylvie Gauvin, DFAIT’s Planning, Advocacy and Innovation department. 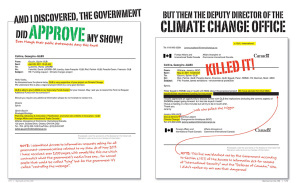 Ironically it was cancelled by the Deputy Director of Climate Change at DFAIT. (My hunch is that my show did not qualify as “Greenwash”). When Canada signed the UNFCCC climate agreement it pledged to support climate change education and adaptation efforts around the world. 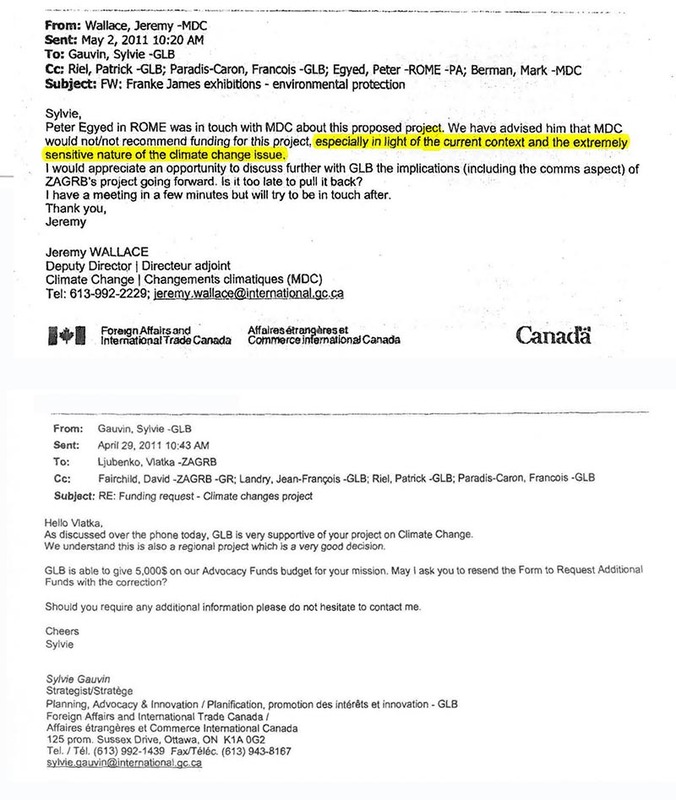 The fact that reducing greenhouse gases is in conflict with the development of the oil sands does not free them for their obligation under the UNFCCC agreement. 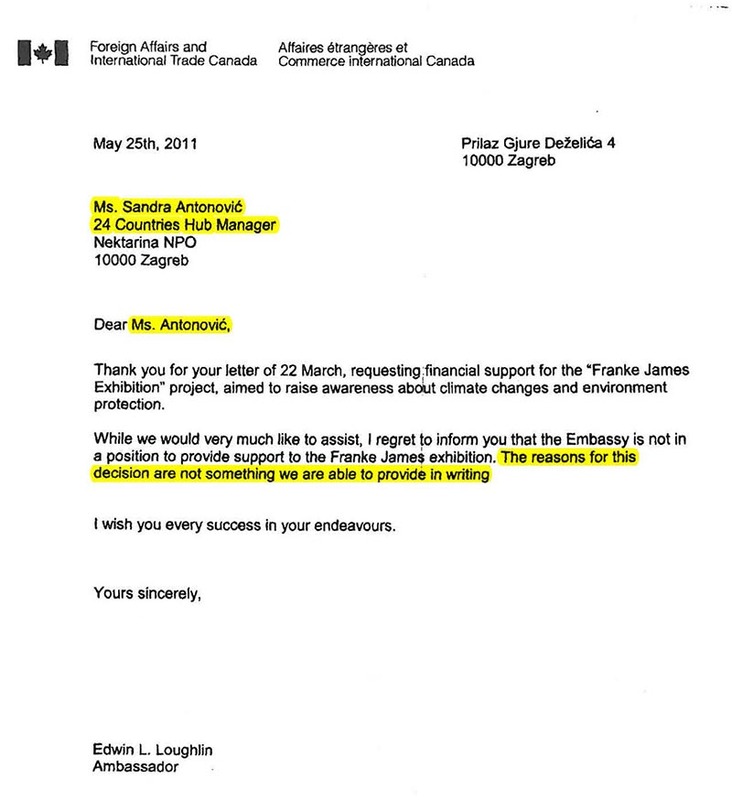 The Ambassador’s opinion is redacted under 21(1)(b): “We do not support private campaigns, unless providing such support will clearly advance broader Canadian interests and in this case we do not feel it does so.” I don’t know what arguments the OIC used to get the sentence unredacted however it appears that it does not qualify as advice. Go away. Do Not Look Under This Redaction! DFAIT is still arguing that Olivier Roy’s statement below should remain redacted under 21(1)(b). Oh my! Somebody at DFAIT goofed. The truth slipped out under a prior access request so we can actually see that they are covering up whatever ‘stuff’ could be politically embarrassing. What will they do when Bill C-51 is passed? 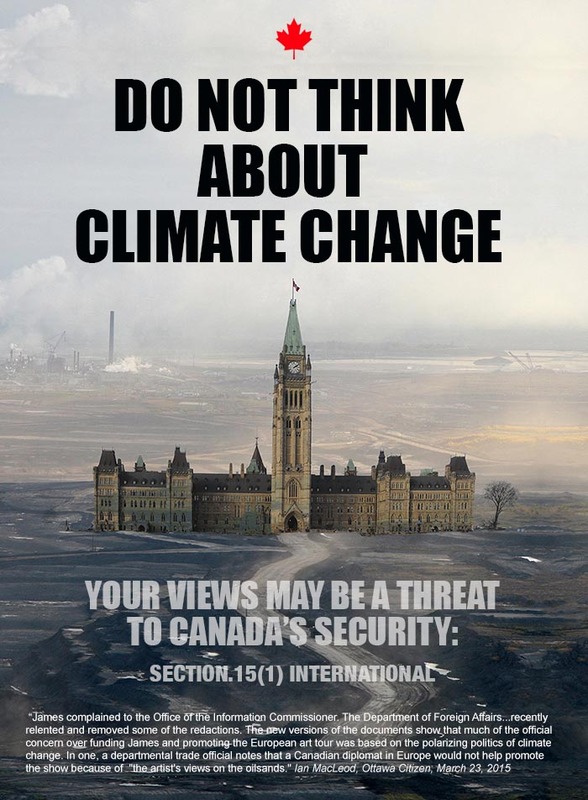 Is the Harper government labelling anyone who questions their policies on the oil sands as ‘threats to national security’? My experience — and new evidence from an investigation by the Office of the Information Commissioner shows that to be the case. In my case, they have abused their power by misusing high-level security clauses to hide their role in bullying my supporters and stopping my privately sponsored climate change art show from happening in 2011. 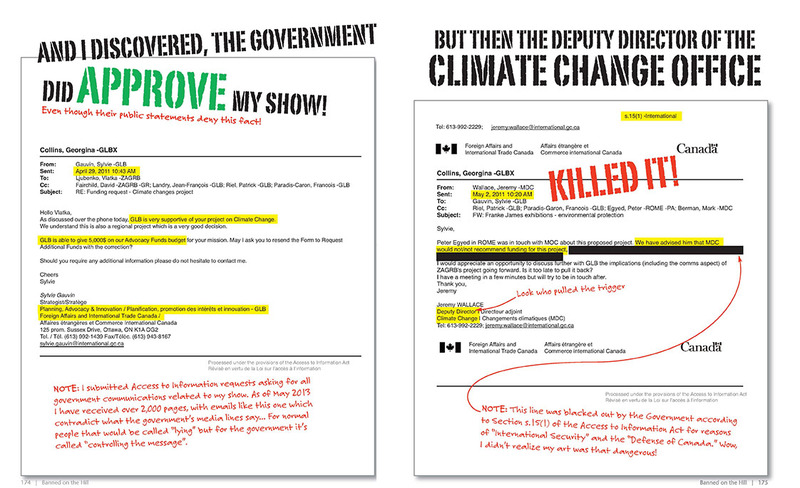 “This is a prime example of the tyrannical information management that Harper’s Conservatives engage in on every file. Access to information is one of the only means we have of holding governments accountable, and these findings show that Harper’s Conservatives are actively subverting that process. The findings show that exemption clauses are not strictly followed and instead are applied to material simply because it does not fit into Stephen Harper’s vision of Canada. There is blatant evidence here of trying to protect the vested interest that Harper’s Conservatives have in the oilsands. The exemptions clauses are applied in ways that are a real stretch. It waters down access to information process in Canada when it is abused in these ways. The government’s proposed security legislation, Bill C-51 will give authorities more power to withhold information that should be publicly available. It will crush dissenting opinions. How many Canadians are going to stand up to the government if they know that the Big Brother and Secret Police Bill C-51 will let the authorities work outside of the law? Which reminded me of the spooky feeling I had when I looked at the “cc” list on Access to Information documents regarding my cancelled art show. 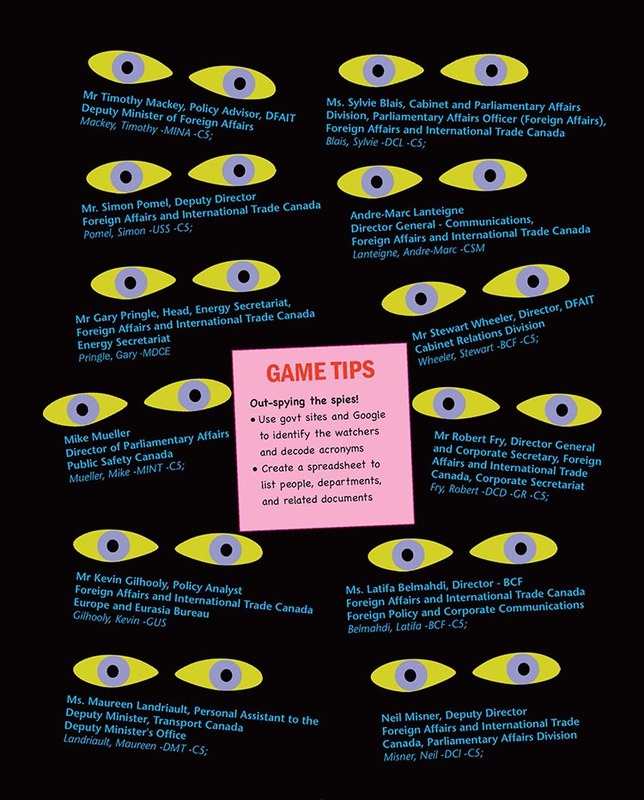 I was surprised when I drilled down to see who in the Canadian government was watching my file. This “Spies and Prowlers” image is from my chapter called “Games Bureaucats Play”. I realized that the eyes spanned multiple government departments from DFAIT, to Environment Canada, Transport Canada, and Public Safety. [Conservative Minister] Blaney said a new broader definition of threats to national security (which includes interference with “the economic or financial stability of Canada” or with critical infrastructure) will apply only when it comes to information-sharing provisions. Blaney said it would not be used when it comes to CSIS’s exercise of its new powers to disrupt activities of suspected threats to national security. The spy agency would use its new powers against threats to national security as they have been defined in the CSIS Act for the past 30 years, he said. I am a retired teacher now running for the Green Party for the Saskatoon West riding federal election. I have been run out of two communities for expressing views against neocons and extractive industries. Franke, you are an inspiration and totally without fear. Good on you! I am not surprised that Harper controls everything that he touches. The only good thing that is happening right now is that we are having a real pile-up of things going wrong for him: the Duffy trial, oil price plunge, recession beginning, Syrian immigration debacle, a surplus that is really a deficit, and so on.